A strong, physically put together receiver who plays much more compact and coordinated than his 6-4 frame would leave you to believe. Displays average short area quickness for his size, but isn’t overly physical vs. press coverage. Tends to get jammed up easily and has a tough time separating initially off the line with corners who want to be physical. Does a nice job using a stutter step to get corners off balance and can accelerate quickly vs. any kind of cushion, but hasn’t been effective vs. press consistently. Isn’t a burner, looks like a 4.55 guy. However, plays fast because he is a powerful route runner who has good initial quickness both off the line and into his route. Displays an explosive element to his game after the catch and can fend off would be tacklers as well. Doesn’t have much wiggle when he gets up to full speed as some stiffness does show, but he runs hard, lowers his head into contact and gets north to south quickly. For his size does a nice job showing good change of direction skills and balance on sharply breaking routes. Runs routes at full speed, keeps his feet under him and can create a burst/separation out of his breaks. Tends to round off his angles a bit, but uses his body to box out defenders and isn’t afraid to pluck the football away from his frame in traffic. Exhibits good body control and coordination when asked to adjust. Uses his big, strong hands well to pluck off his frame and is a threat in jump ball situations. Does have his fair share of lapses in concentration and will put the ball on the ground at times in traffic. However, showcases a natural feel for the pass game, knows how to sell the double move and works hard to run himself open when asked to improvise. Also, is effective on the edge as a blocker, sticks to defenders and can win one-on-one matchups consistently. Strengths: Elite size and speed combination – Big play threat – Separates well down the field – Normally runs very crisp routes, doesn’t seem to lose speed coming out of breaks – Good, but not great hands – Positions his body well. Weaknesses: Will occasionally get lazy and round a route off – Used to shy away from contact at times – Not a terrible blocker, but could improve – Few true weaknesses, good all-around player. 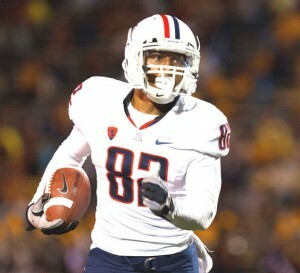 Arizona Wildcats wide receiver Juron Criner is a big (and sometimes), physical prospect who (with a little polish) could become a great talent in the NFL.Criner’s best attributes are his special combination of size and speed. He doesn’t play quite as tough as you might expect for a player of his size, but he shows a nice ability to get downfield and simply come down with the football. At best, he’s an average route runner, but when the ball is in the air, Criner’s hand-eye coordination is top notch. Using his body to shield off defenders, he can elevate and catch the ball in unorthodox ways. Criner is a bit sloppy with his body control, but does a good job to get his hands on the ball and come down with it.After making catches, he looks to get upfield hard and fast. In order to keep improving, he needs to do better using his hands to get off of press coverage. Criner absorbs contact while route running very well. He’ll need to do a better job with coming back to throws and not just allowing the ball to come to him.Criner needs to run well at the combine and display his athleticism to separate himself from other projected middle round receivers. Juron Criner is a big mid round receiver prospect. Gets down the field well for his size. Not overly physical. Not overly fast. But seems to me like a solid possession receiver who can move the chains and, when asked, stretch the field. The Giants may very well lose Mario Manningham. Criner is a different prospect. Manningham is fast and elusive; Criner is slower and not elusive. But Criner would bring an element of size that the Giants don’t have. I think Eli would love having him on a crossing route on 3rd and 8 as a safety valve. His size is an advantage, and as a third receiver who can contribute on third downs and in the red zone, wouldn’t be a terrible option. I would prefer him to be more physical, and to run sharper routes. But is a nice looking mid round prospect who can contribute right away and contribute in a meaningful way. I just don’t know about this guy. 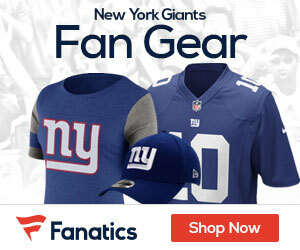 We had the most explosive WR core in Giant history, based on speed and quickness. Now we want to get back to Ike Hillard and Amani Toomer? No thank you. I want burners. Actually if you looked at the scouting reports for Nicks, Cruz, and Manningham, neither supposedly has game changing speed. In fact at combine all 3 had 40 times in the 4.5 range which is underwhelming to say the least for a WR. It’s all about how they look when they’re on the field.